We have been coordinating environmental youth community service projects personally and through our non-profit KIRF using the Roots & Shoots service learning model since our kids were in pre-school**. Each project we have done with kids has been a learning experience and has made a difference. I like doing youth service projects is that kids, and young people in general, seem to be more open to change and making a difference. Since our first youth service project in 2004 (we participated in the Coastal Cleanup that fall) our kids have gotten older but the qualities of their favorite projects have not changed. (1) Ride a bicycle at leas t once a week. Riding bikes together is a fun and playful activity in itself. And, if a parent works close to home, riding to work or school with their kids can make a morning commute a fun activity. 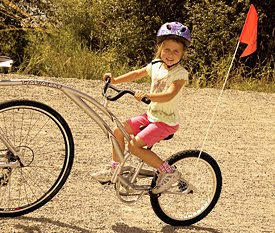 I remember how happy my kids and I were after riding with my 3 year old daughter riding a Trail-a-bike hitched to my old Diamondback mountain bike and my son speeding along on his own bicycle when I used to ride to work and their pre-school/daycare. Another option is riding bikes together as a family on the weekends instead of driving someplace to have fun. Simply by riding a bicycle instead of having their parents drive, kids can reduce carbon dioxide emissions into the atmosphere. (Ages 3+--using a Trail-bike or bike seat for the young ones) The photo above is from the Adam's Trail-a-bike web site. (2) Turn the lights off. Nearly all of the electricity in our town's local utility company comes from power plants that burn fossil fuels to generate electricity. If kids use less electricity from non-renewable energy powered sources then they are helping to stop global warming. This can be re-enforced by having your child do a run around to "check the lights" before leaving the house and turning the lights off after he or she leaves a room that is empty. 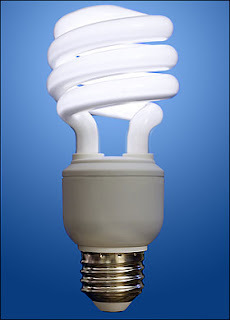 (Ages 5+) The photo of the energy efficient light bulb on right is from Google images. (3) Use reusable non-plastic bags when shopping and in bag lunches. What are plastic b ags made out of? Petroleum products. We try not to use disposable plastic bags. For school lunches, the kids can use reusable lunch containers in their lunch box or reusable lunch bag. Schools and camps can re-enforce this choice by giving out "No Bag" lunch awards such as is done at our kids' California Junior Lifeguard (JGs) summer camp programs. 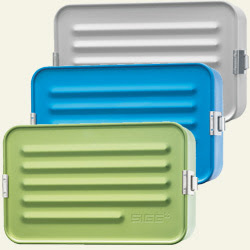 (Ages 5+, 9+ for JGs ) The photo on right of aluminum food storage containers is from Reusablebags.com. (4) Make a reusable shopping bag out of an old t-shirt. This is really fun creative project using a kid's t-shirt that they may have outgrown. As a resusable shopping bag the t-shirt can have a new life as bag for groceries, soccer clothes, beach stuff, taekwando clothes, almost anything. Using reusable shopping bags conserves paper and plastic which are produced using fossil fuels. 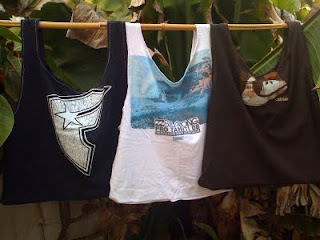 (Ages 10+) The photo below is of three reusable bags I made out of our son's old t-shirts. Photo by Angela Rockett Kirwin (me). Time: 30-45 minutes per bag. Supplies: old t-shirt, thread, sewing machine, scissors, pins. Directions: Turn the t-shirt inside out. Pin the bottom open end together and sew it. Cut the sleaves off and cut the neck seam off and hem the arm holes and the neck hole. turn in inside-in and voila! You got a reusable shopping bag with handles and maybe cool graphics, too. (5) Make a reusable gift bag out of an old piece of clothing. I got this idea from the reusable gift bags sold in Patagonia's retail stores that are made of remnant cloth. Instead of throwing away the fabric scraps Patagonia reused them to make gift bags and added matching ribbon to serve as a tie. (Ages 8+) The photo below is a reusuable gift bag used as a swim suit+goggles bag that was made from one pant leg of a pair of old Patagonia boardshorts, Mens XL. 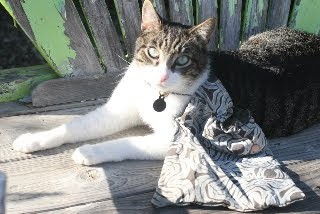 It was made by a nine year old and is modeled by her cat. Photo is courtesy of Jeanne Tanner and was taken by her daughter. Supplies: thread, sewing machine, pins, scissors, ribbon and old pants, t-shirts, skirts...anything that you can get a large rectangular panel of cloth out of. Directions: measure out how big a bag you need and then double the width and add 2 inches. (For example, for a small gift bag about 8"x10" requires a fabric about 10"x 20".) Fold, pin and then seam the top edge of the bag, wide side, sewing. Fold the fabric in half, inside in, top seams facing in, and sew the bottom part together. Stop, rotate the fabric 90 degrees and sew the side until you get 3/4 to the top. Stop. Take a piece of ribbon (for 10" tie strings, cut off 20" of ribbon), fold it in half and tuck it on the side seam's path with the fold part sticking out (and the long strings inside your inside-in bag. Then continue with finishing the side seam and sewing in the ribbon. Turn your new bag reusable gift bag inside-in and you are done. (6) Conserve paper. In addition to eschewing wrapping gifts in store-bought wrapping paper that ends up in the trash, kids can conserve all kinds of paper and recycle used paper. Kids can use GOOS (Good On One Side) plain white paper that is re-used from the printer for art projects. Another way for them to use less paper is have them use both sides of a piece of paper and type reports single-spaced for home work projects if it is appropriate for the assignment and okay with the teacher. Conserving paper helps stop global warming in two ways: (1) Less paper used means less trees destroyed and this is a good thing because trees are the best at absorbing carbon dioxide in the atmosphere* and (2) manufacturing and transporting paper requires burning fossil fuels which contribute to global warming. (Age 9+) The photo above shows a Maasai school girl watering her tree seedling that is guarded from goats with acacia thorns. She planted this tree for her Roots & Shoots reforestation project at her school in the Lake Eyasi region of NW Tanzania. Photo by Angela Rockett Kirwin (me). Our young children have done all these activities with little assistance from adults, so I know that they are doable and fun. I believe that our generation and the generations before ours created global warming and it is our generation and the generations after ours that can un-create it. I feel bad that our kids will inherit the mess that we are leaving them. It will take time but we owe it to our kids to teach them to learn from our mistakes that have caused climate change in the first place. Each person, even a five year old, can make a real difference. As environmental activist, humanitarian and primatologist Dr. Jane Goodall has said, "...every individual matters, every individual has a role to play and every individual makes a difference." Or in other words, "Be the change you want to see," said Mahatma Gandhi. 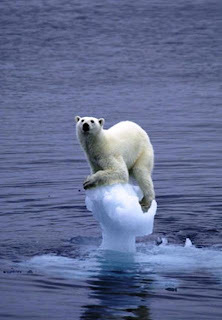 * Read how wild polar bears are in danger of becoming extinct due to global warming: "On Thin Ice" by Daniel Glick, National Wildlife Federation. ** Find out about more age-appropriate community service projects for kids that help animals, the environment and the human community at rootsandshoots.org. *** Learn about how all plants consume carbon dioxide but trees are best and what you can do at environment.about.com . You can read more about how forests mitigate global warming and a status update on the old growth redwood forests of the Pacific Northwest in the article "The Super Trees" in National Geographic Magazine, October 2009.